When I was growing up, my mother would often say to me “For a smart girl, you sure say (do, think) some awfully stupid things. It sounds mean, but she was right. Sometimes it’s like my big brain takes a coffee break, “Be back in ten”, and my little brain, my brain stem, the primitive part that keeps you breathing and reminds you to run from man-eating tigers, fills in. I’ll give you an example. 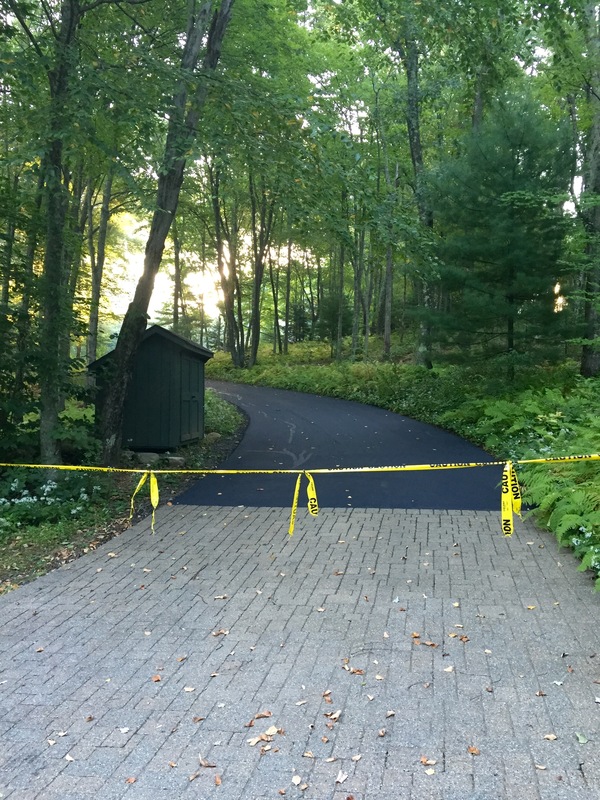 This week, we had our driveway repaved. The guy showed up early in the morning just as I was leaving for work. My husband had reminded me that when I came home, I would have to park on the side of the road and walk up to the house. Once the fresh asphalt is applied, you can’t drive on it until it’s cured in about 48 hours. Just in case I forgot, the contractor would be stringing some yellow caution tape across it. I was good though. I remembered. I left work early so it wouldn’t be pitch dark when I got home. I’m not usually a fan of walking through the woods alone. In the dark. With the glowing animal eyes and cracking twigs. And low hanging branches that whack you in the face and scare the bejesus out of you. I parked the car, locked it and took my keys, got the mail, started up the driveway and stopped short. The contractor had strung the caution tape from a tree in the woods on one side of the driveway across to a tree in the woods on the other side. How was I going to be able to get up to the house? I didn’t want to be climbing over rocks and tree roots in sandals with heels. And what about ticks and poison ivy with my bare legs. What was I going to do? And then coffee break was over and my big brain came back. “Just lift the tape and walk under it.” Yeah. So at another time in my life, that would be the end of the story. I would have laughed at myself and repeated my mother’s “For a smart girl…” comment. But I guess six plus decades of life has brought some changes. I’ve discovered that if you are open to it, almost everything that happens in your life can teach you something. In this instance, I realized that so many of the “obstacles” in life are simply illusions; a knee-jerk fear reaction from the little brain. If you take a deep breath and really look at them, what seemed insurmountable often becomes a hill of beans, nothing. That’s not to say that nothing ever blocks your way. But there are really so few things that do that. And those things that are truly stopping us may be life telling us we are headed in the wrong direction. The point is, we can’t let the little brain call the shots. Unless you’re running from a man-eating tiger. This entry was posted in Change, Daily Life, Growth, Uncategorized and tagged aging, learning. Bookmark the permalink.